Minolta made the first good AF PP SLR. Released in February 1985. 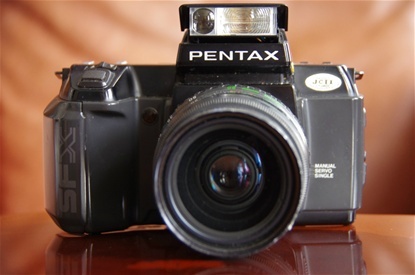 The Pentax ME Super followed the ME from '76, but offered manual mode, 1/2000 shutter time and warning light for EV compensation. It introduced another world first, the push buttons for shutter time control. It may have looked like progress at the time, but, although copied by all other brands, was to last for only some ten years. Well functioning dials ARE faster. ME Super, here with winder for 1,5 fps. Sn. 2267313. Push buttons instead of dials. 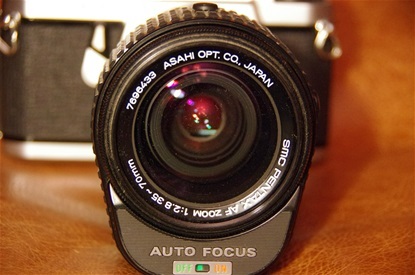 This is another worlds first from Pentax: Autofocus PP SLR. The M-series was introduced in 1976 with the ME. 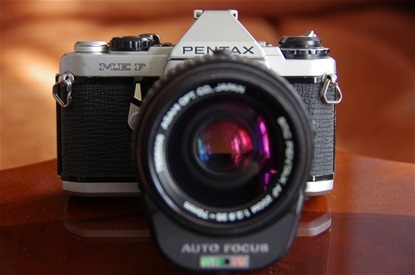 Just into the next decennium Pentax launched the ME F with AF zoom 35-70mm in 1981. A new sensation. But although Nikon and Canon presented their versions soon after, the system was not good enough. I have two fully working cameras, this one with sn. 3551536. The Nikon FA deserves a place in PP SLR history. More will follow. 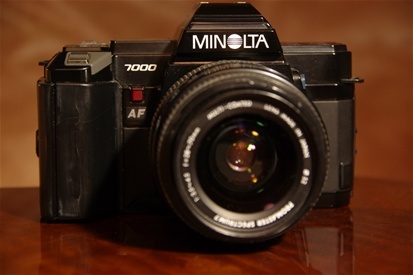 So, in 1985, Minolta presented the breakthrough for AF PP SLR, the 7000 AF. It was a sensation, even though Pentax was 4 years ahead in 1981, Minoltas system was so much better. The problem for Minolta was that Honeywell claimed the system to be theirs, and Minolta was given a fine so high (127,6 million $!) that they struggled ever since. 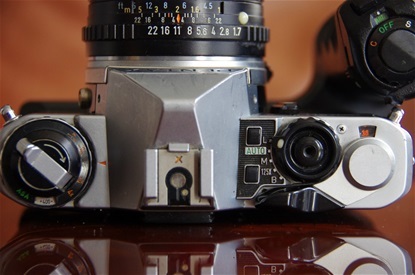 The 7000, as most Minoltas, had different names in different markets, Dynax, or just 7000 AF in the European market, and Maxxum in America and Alpha in Japan. Sn.20025673. 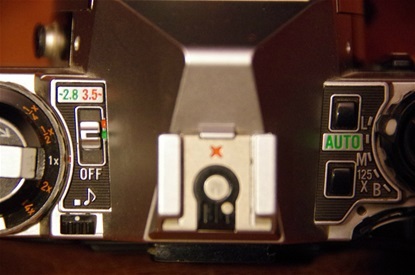 A very typical layout for mid/late 80s: Push the buttons to the left (Over/under exposure, ISO, Mode or Drive) and correct the values with the up/down pushbuttons behind the shutter release button to the right. Batteries inside the extended grip on the right hand side. Note the small P just in front of the Lock/Open slide. Pushing the lowered P-button gets you back into Program mode from any other mode you are in. 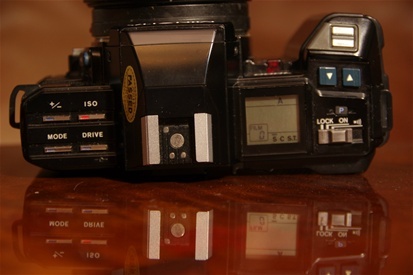 Pentax first working AF PP SLR was the SFX launched in 1987. It came with another worlds first: the built-in flash. All other brands would soon follow. 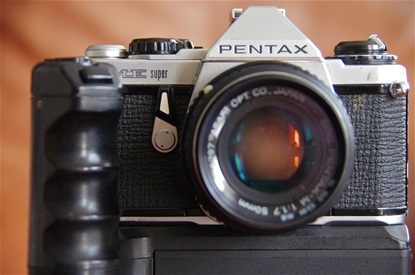 This was my first Pentax, and although it had the slow push buttons and a not so fast AF, I came to stick to the brand. Especially after the very good Z1 and the lovely MZ-5. (And that was even way before I discovered the very old Asahis!) Sn. 3852963. 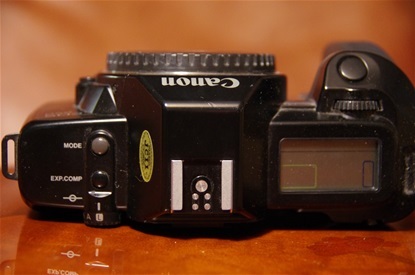 Minolta led the auto focus development from 1985 till the release of Canon EOS 650 in March1987. 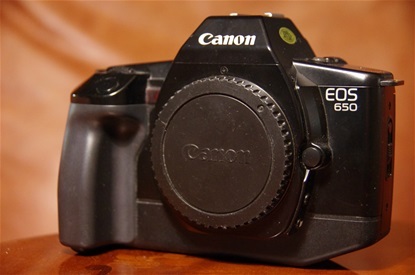 From then on, the many different EOS (Electro Optical System) cameras has dominated the Film SLR world, and later into the DSLR world, taking higher market shares all the time. Here a 650 house with s.n. 2054978.